That’s the finding of a recent poll from Insureon and Manta -- "Small businesses are unprepared for disaster." Sixty-one percent of small business owners didn’t have a formal business plan, and 31% didn’t know if their businesses could survive a disaster that required them to close down for more than a month; 20% of those having reported a closure never reopened. Disasters can occur at any time for a variety of cases, such as hurricanes in the Southeast, wildfires in the West, tornadoes in the Central States, and even a volcano in Hawaii. I’ve written about disaster preparedness before. But too many businesses don’t take the time or invest the money to be prepared. Keep records of contact information for employees, customers, vendors, your insurance company, SBA (800-359-2227), and FEMA (800-621-3362) that are accessible during and after a disaster. Back up records to the cloud. Also keep this information on your smartphone that you have with you. 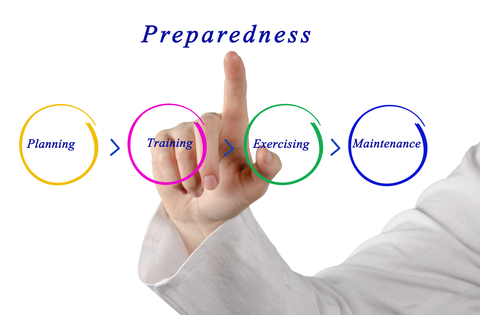 Create a plan of operations to get through a disaster and recover from it. There are many free resources to help with this. Check out ready.gov, which has specific suggestions for earthquakes, hurricanes, inland flooding, power outages, and severe wind/tornadoes. You know your risks, so make special preparations accordingly. Business interruption insurance. This can be a stand alone policy or a rider to your existing business owners policy that will help to pay your bills during a closure. Flood insurance. This is separate coverage that is purchased through FEMA’s National Flood Insurance Program. You definitely should have it if you're located in a flood zone and should consider it even if you’re not (floods can happen anyway). You must buy the coverage 30 days prior to an event in order to be protected. Work with a knowledgeable insurance agent to discuss your existing coverage, what else would be helpful, and how you can obtain the protection you need in the most affordable way.